Would you like to easily view statistics and results for information you collect in your forms? With surveys and polls, you can easily analyze data and generate reports, and even share results with your users. 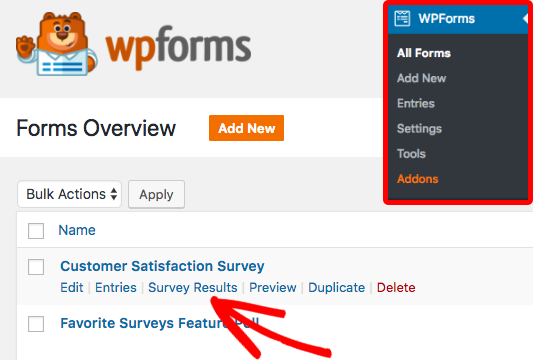 In this tutorial, we’ll show you how to install and set up the Survey and Polls addon for WPForms. Requirements: You will need a Pro license level or higher to access the Surveys and Polls addon. Next, go ahead and install the Survey and Polls addon. For more details, please see our step by step guide on how to install addons in WPForms. Once the addon is installed and activated, survey and poll functionality can be enabled on any new or existing form. If you’d like to create a new form, the addon includes two templates: Survey Form and Poll Form. For our example, we’ll be creating a customer satisfaction survey. To start, we’ll create a new form with the Survey Form template. By default, the Survey Form template will include several fields where users can easily leave their feedback. However, you can add, change, or remove any fields you’d like. There are two types of reporting available: Survey Reporting and Poll Results. Survey Reporting will collect field result statistics that display in the WordPress admin area, while Poll Results can be added to your site for your users to view. In your form, you can choose to enable Survey Reporting, Poll Results, or both. In this section, we’ll specifically focus on Survey Reporting options. 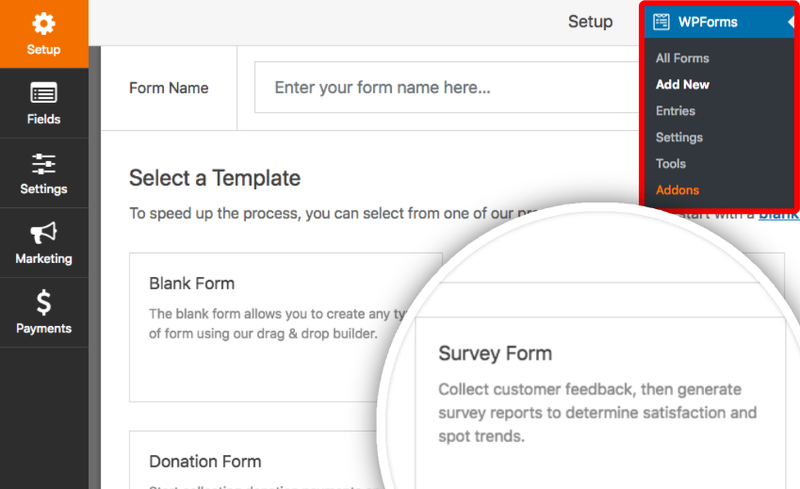 To set up form-wide survey functionality, go to Settings » Surveys and Polls. From here, you’ll need to check Enable Survey Reporting. If you’re using the Survey Form template, this option will already be selected for you. In some forms, you may not need to calculate results form-wide. For more control, you can instead enable survey functionality for individual fields in your form. First, form-wide survey functionality must be disabled. To do this, go to Settings » Surveys and Polls and make sure that Enable Survey Reporting is unchecked. Then, click Fields to return to the main form builder screen. Within the preview area, click the field to open its Field Options panel. Under Advanced Options, check the box for Enable Survey Reporting. You can enable survey reporting in this way for as many fields as you’d like. Poll results will display a summary of all data collected for a field, or multiple fields, in your form. Additionally, you can enable both survey reporting and poll results for the same form if you’d like. The easiest option is to display poll data within your form’s confirmation message. 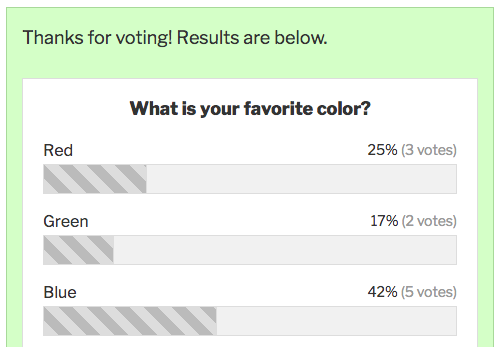 However, we’ll also cover a more advanced option that allows you to add poll results anywhere on your site. Note: If you’d like to reduce order bias in the options you provide, consider randomizing the choices displayed for Checkboxes and Multiple Choice fields. 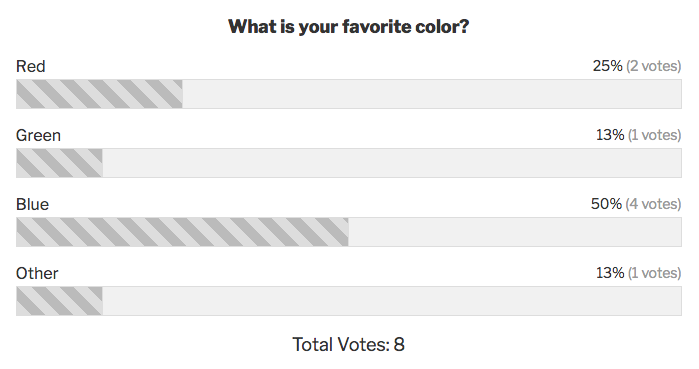 To quickly and easily display poll results to your users, you can enable poll results form-wide. This will automatically calculate results for all Dropdown, Checkboxes, and Multiple Choice fields. Then, the results for these fields will be displayed to the user after the form is submitted, under the confirmation message. To set this up, first be sure that your form is using the Confirmation Message option. You can check on this by going to Settings » Confirmation and choosing the Message option. Next, go to Settings » Surveys and Polls. Here, you’ll need to check Enable Poll Results. Remember, you can also have the survey option enabled if you’d like. Once this option is enabled, the poll results will display immediately after the user submits the form, along with any confirmation message text. 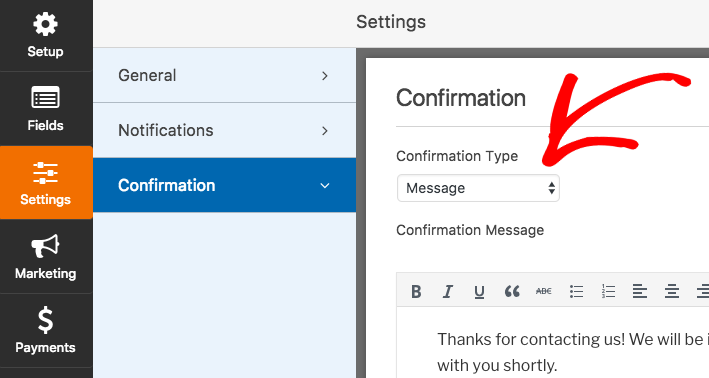 If you’d like to use more customized poll display options, you can use shortcode instead of (or in addition to) enabling poll results within your form’s confirmation message. For this shortcode option, you do not need to have poll results enabled within your form. To get started, just be sure that you have at least one Dropdown, Checkboxes, or Multiple Choice field in your form. These are the fields that you can use to collect poll data. You can customize each part of this shortcode depending on which form, field, and display options you’d like to include. form_id: The Form ID identifies which form you’d like to use. 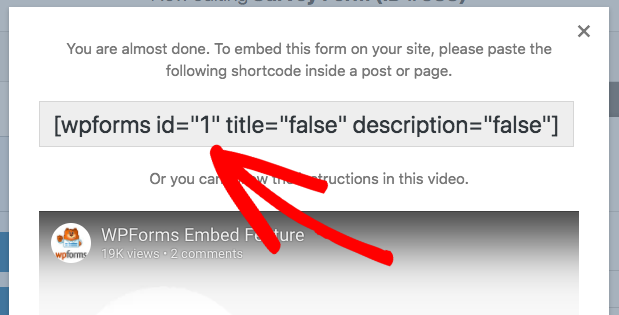 To easily find the Form ID number, you can click Embed within the form builder and check the shortcode there. field_id: The Field ID indicates which Dropdown, Checkboxes, or Multiple Choice field you’d like to display data for. You can find this ID at the top of the Field Options for each field. label: This will determine whether the field label is included at the top of the poll results. To display the field label, set this to "true". To hide the field label, set to "false". counts: With this option, you can choose whether to display the number of votes for each option and a total count of votes at the bottom. To display the vote count, set this to "true". To hide the count, set to "false". Once survey reporting is enabled for a form, you’ll be able to view reporting data for any applicable fields. Note: If you’ve already collected entries for a form and decide to enable survey reporting at any point, survey reports will include this earlier data as well. To generate the report for a form, go to WPForms » All Forms and hover over the form to display additional options. Then, click on Survey Results. After the results are calculated, the page will display results for each applicable survey field. The format and options included for each field will depend on the field type. For any of these field types, you’ll see both a graph and table of results. You can choose the type of graph displayed in the upper right corner for this field. The results table will, by default, order by percent of responses. To change the sort order, you can click on Responses. For Likert Scale fields, data will be displayed in table format. Within the table, you’ll be able to see the number of votes for each option, as well as the percent of users who chose each option. By default, Likert Scale fields reports will display in the order that you offered each option. However, you can change the sort order by clicking any of the top options in the table. A Net Promoter Score question will ask users to respond using a 0-10 rating scale. Based on the number they select, the NPS approach will divide users into three categories: Promoters, Passives, and Detractors. 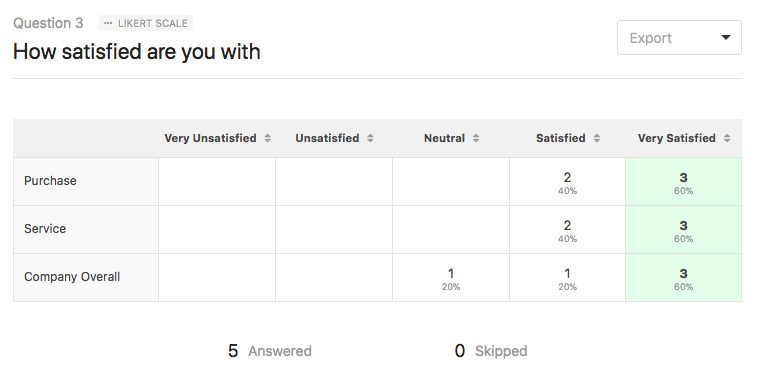 In the survey results for a Net Promoter Score field, you’ll see a graph of score results, as well as a table indicating both the number and percentage of users in each category. WPForms will also automatically calculate your Net Promoter Score for you. If you’d like more details on the meaning of these categories or your overall score, please see our Net Promoter Score tutorial. These fields will display the text entered by the user and the date and time of the related entry. To quickly access the full entry, you can click the icon on the far right. 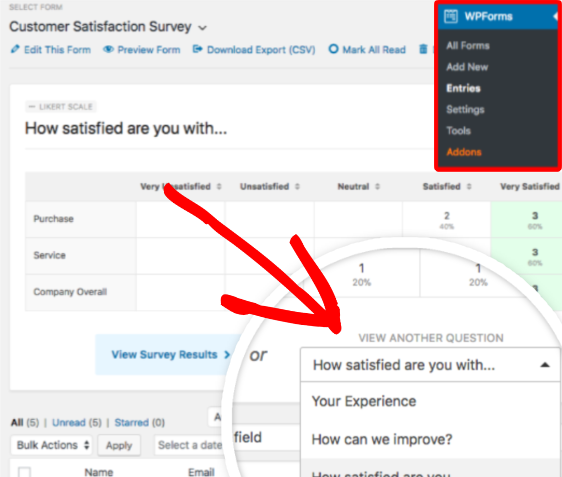 When viewing all entries for a form under WPForms » Entries, any forms with survey reporting enabled will display a single field result preview. If you’d like to change the field that’s displayed in this preview area, you can use the View Another Question dropdown. This change will be saved for future views of this page, and can be changed again at any time. Within the Survey Results, you can easily save and/or print reports for the entire form or individual fields. 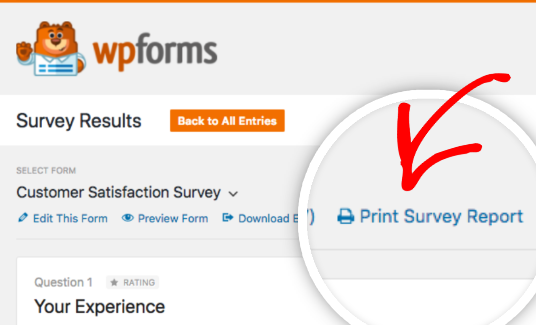 If you’d like to print the complete survey report for a form, you can simply click on Print Survey Report in the top menu of the Survey Results page. 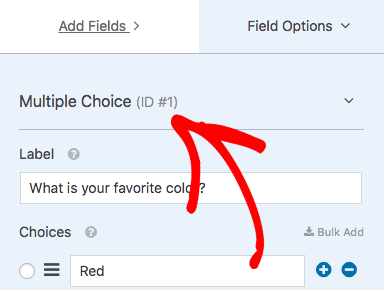 Before printing, you can easily hide fields if needed by clicking the orange circle in the upper right corner of each field box. This will grey out and collapse the field results so that only the field label, field type, and question number are visible. For any graphs in your report, you can also choose the type of graph directly on the print screen. From the Survey Results page, you can choose to save or print individual form fields instead of the full report. This can be especially useful if you’d like to include specific results in a presentation or document. To save or print a single field, scroll to the field you’d like and then click the Export option in the upper right corner for that field. From here, you can choose to save as a JPG image, save as a PDF document, or print the results. That’s it! You can now create surveys and polls, as well as generate reports and display results to your users. Next, would you like to learn more about options for the Rating field? Be sure to check out our Rating field tutorial for details on all of the built-in customization options. Fixed: PHP notice when printing survey results. Changed: Likert and NPS field display priority in the form builder. Fixed: Typos with NPS form templates. Added: Net Promoter Score survey form templates. Added: Net Promoter Score field and reporting. Changed: Minor styling adjustments to Likert to improve theme compatibility. 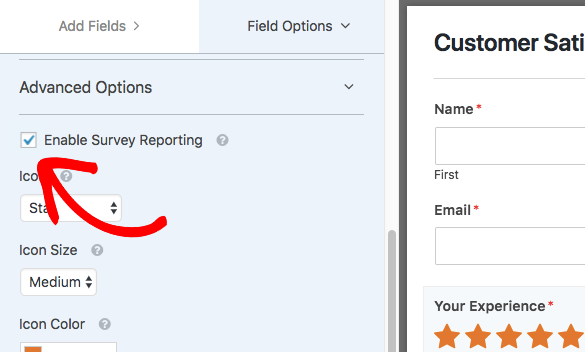 Fixed: Survey report print preview issue hiding empty fields.